A couple of conversation threads on Facebook and a recent news article on the web have brought to my attention the fact that the Craigie Primary School in Perth, Scotland, has run afoul of the office of the Lord Lyon King of Arms for using an unregistered armorial device as their badge. Their badge came to the attention of Lyon after the school tried to design a wall mural. Much of the discussion back and forth in comments on the news article and on the Facebook posts seems to center around: (1) whether the school's badge is "heraldic;" and (2) whether Lord Lyon should waive the registration fee for a primary school. Let me address the second argument first. The Lyon Court is a branch of the government; there may, in fact, be no provision for Lord Lyon to waive the fees (which go into the government treasury and are not earmarked for the use of the Lyon Court). So even if he wanted to waive the fee, he may not be able to, in this or any other instance. 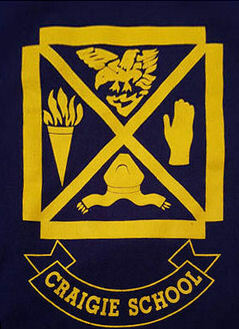 For the first argument, that the school's badge isn't really heraldry, let's take a look at what they have been using. Well, it's certainly not classic heraldry, is it? And it's not on any of the standard shield shapes. The standard shield shape seems to be the underlying argument by those who think that Lord Lyon should let this badge slide. And yet ... A.C. Fox-Davies, in his A Complete Guide to Heraldry, notes that "Arms [may] be depicted upon a banner, a parallelogram, a square, a circle, or an oval; and even then one would be correct, for the purposes of armory, in describing such figures as shields on all occasions on which they are made the vehicles for the emblazonment of a design which properly and originally should be borne upon a shield. Let no one think that a design ceases to be a coat of arms if it is not displayed upon a shield." In short, the shape of the shield doesn't matter; if it looks like heraldry, and it's used like heraldry, well, then, it's heraldry.